Powerhouse! Loads of power to all channels!! Big difference over lesser quality receivers!! Analog to hdmi upscale is only 480i. What’s up with that?? The sound is AMAZING! The manual is not very helpful. My advice is to use it as a guide and just play with it to learn it yourself. I like the 3 "user" buttons and have assigned them for movies, stereo music and 5,1. Im the proud owner of a Denon AVR 3806, I did NOT purchase this reciever for it's Video capabilties, I did purchase this reciever for it's 120WATTs of independently driven channels, 5 fiber optics audio inputs, 2 digital coax inputs, 840wtts total power, extremely low THD 0.05% this value provides very good audio quality very pure sound very low distortion. It's not as complicated as some reviews make it out to be. I dont find it any different than my old yamaha or pioneer recievers. The heavier the reciever the better it is. The only 2 things I can mention as a strengths is that the 3806 sounds as good as the 3805 and that I am confident Denon will make a MUCH better unit in the next 3800 series receiver. Too many problems to list with HDMI. User interface and remote a step back from the 3805. The remote with the 3806 went bad after about a week as well. Denon really dropped the ball with the 3806. The 3805 was an outstanding reciever and I was hoping the 3806 would follow suit with the added HDMI support but that proved to be wrong. Not only does the HDMI fail to function properly as it does in many other receivers but the remote and user interface pail in comparison to the 3805. I used to sell Denon 3805's all of the time as I new it was an outstanding bargain but after my experience with the 3806 I know recommend the 2807. I have been honest with the customers with the problems related to the 3806 and am hoping Denon makes it right in there next 3800 series receiver. As someone who has been an advocate for Denon receivers I was greatly disappointed with what Denon put out with the 3806. I would recommend that potential buyers get the 2807 or wait until Denon fixes the bugs in the next 3800 series receiver. Even though I personally use high end pre-pro's for my personal system like Anthem, Proceed, Halcro, Lexicon and the like I used a Denon 3805 for about 5 months and was delighted. The 3806 lasted about 2 weeks and I was happy to sell it at cost. I have never sold another 3806 since my main concern is that my customers are happy. After the experience I had with it I could not sell one and feel my customer would be happy. I am confident that Denon will address all of the problems in the next 3800 series and only than will I continue to sell it. I have given a Value rating of only 2 stars as I feel the 2807 is a MUCH better value at this time. The 3 overall rating is for the fact that it does sound as good as the 3805 (which was a 5 star receiver in it's price class) but I knocked it down in it's usability and HDMI problems. Denon does have good customer service. You name it I have tried it! POWER. CLARITY. VERSATILITY. HAMMER OF THE GODS!!!!!! The remote control is average at best, but it is definitely nothing to fret over. It gets the job done. When my Sony STRDE-995 lost a battle with a lightning bolt, I decided it was time for a serious receiver up-grade. After extensive research on the internet, I decided to purchase a Denon AVR-3806 because of the many positive reviews I read. After 3 months of use, let me just say that I am not disappointed. The sound of this receiver is jaw dropping. When I first hooked it up, I decided to air it out with Metallica's "Metallica" CD. I cranked up the first track, Enter Sandman, to ear splitting level and still had power to spare. This receiver definitely packs a punch. The music was extremely LOUD, but it remained crystal clear. Movies achieved the same result. The LOTR DTS 6.1 soundtrack is absolutely stunning. The AVR- 3806 seems to give it more definition than I could achieve with the Sony, which sounded great by the way. Set up wasn't very difficult at all. I tried the Auto Set-Up feature, but afterward I decided on a manual set up for my speaker levels. The Auto Set-Up did do a good job of determining the distance of my speakers from my listening chair. This receiver has more hook-ups than you will ever need. It also has HDMI up-conversion which will come in handy when I decide to upgrade my television. If you like bells and whistles, then you will love the AVR-3806. This receiver is packed with features. The bells and whistles have bells and whistles. If you like effects, there are 10 different proprietary surround modes including four different room reverbs. Each reverb effect offers five different room sizes giving you a total of twenty different effects. I especially like the Mono Movie effect. It is great for watching movies that are broadcast in mono. It broadens the sound field much better than Dolby D or DTS NEO:6, both of which are designed to work with a stereo signal. The "Pure Direct" listening mode is great for CDs unless you have a powered subwoofer and then I would suggest the Virtual Surround mode. Virtual surround sends a signal to the mains and also send a line level signal to the subwoofer. Lets talk EQualizers! The AVR-3086 features a nine band graphic EQ that I haven't felt the need to use very much because it sound so good without it, but I'll tell you about it anyway. You can adjust the EQ for ALL SPKRS, L/R SPKRS or each speaker can be adjusted separately! In addition to the nine band graphic EQ, each surround mode also contains Bass and Treble Tone Controls! This receiver also has a built-in crossover that allows you to set your crossover points for each set of speakers. Believe it or not, I have just scratched the surface in discussing the features of this receiver. Because of the numerous features packed into the AVR-3806, It may be intimidating at first. However, don't despair, just take a deep breath and figure it out. Once you get used to the operation of this receiver, you won't have any problems. Has a lot of power and one of the best processors (AL24). If you hook up all amps to your preouts you can still use your speaker terminals for extra speakers. It also has a zone 2 and 3 for other rooms or hook up for multiple speakers to your main system. The remote is hard to figure out but, if you play around with the remote a little you'll figure it out pretty quick. If the remote freezes up take out the batteries for about 5 minutes. There are some features that you have to access from the front panel and not the remote. I used to own the Denon AVR-3802 receiver which is a few years old but, still one of Denon's most popular archives. 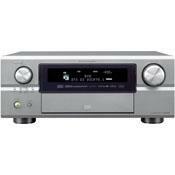 I purchased the Denon AVR-3806 in Feb. of this year. The reason I wanted that receiver opposed to my 3802 is because I bought a 1080i 42" HD flat screen DLP with DVI hook-up and I needed a receiver with HDMI hook-ups. I also wanted more optical/coaxial ins/outs. I didn't want just anybody to have my old receiver so. I sold it to my sister since I know she'll take care of it and not drive the hell out of it. Anyway I bought this Denon AVR-3806, hooked up all of my Definitive Technology speakers(towers 7002's front and 7006's rears)awesome speakers and they have built in powered subs besides my 4 Supercube II's. When I turned this thing on I was in awe...! I did not think there was anyway that I bought a mid to high-end receiver that cheap(even though I get a deal on everything I by at ABT)sound like a $4000-$8000 receiver. It might have to do with the Al24 Processor Plus that's in the 3806. Which after all of my research of the receiver and processor I did I found out the receiver is one of the top 3 receivers since it came out till present. It's rated #1 as a receiver because of it's processor which is one of the best in the business. Because I run all of my speakers through more powerful amps, my 2 Adcom GFA-555's and 2 Denon POA-2400A(200w@8x2) I was going to by just a processor. Recently I listened to the Krell Showcase and Audio Control Maestro2 and wasn't impressed to the detail they had that compared to my Denon AVR-3806. I thought they were very similar so, there was no need to replace. Now I use my 3806 as a processor because that AL24 is awsome and brings out all of the detail in my Adcom's and Denon's. I just bought the new Denon DVD-2930i single disc all format player and it also came out with the AL24 Processor Plus like the receiver so there is no loss or reprocessing by the 3806. My Denon AVR-3806 has a great processor with tons of detail and definition with perfect highs, mids, and midbass. It also has a great LFE crossover. The secret is the Denon's 3806's AL24 processor, a couple of 150- 200w per channel amps because the 3806 comes with 120w per channel which is sufficient but, the more power the better the processor sounds, also Definitive Technology speakers and subs. The Def Tech's are a great match with the Denon. When or if you buy a Denon DO NOT forget to get an excellent line conditioner like Panamax and high silver conduction interconnects(Audioquest).You'll be surprised at the sound. Even if you use the built in amps it still sounds awesome. I personally like a lot of power because my Def Tech tower speakers and huge center channel need a lot of power to sound there best. Never had a problem with my Denon AVR-3802 or my AVR-3806. Very reliable product but, you could buy the extended warranty for piece of mind. Outstanding receiver. First - Yes the manual is poor and the device takes getting used to. From the reviews, however, I was terrified I wouldn't get the thing going. It was less convoluted than some have described. It was only marginally more complex than the Onkyo SR803 that I returned because of lack-luster sound quality. The sound is truly fantastic. Just a tick below separate component systems I have had experience with like Classe and Alpha. I already had an AVR-1000 from years back and was afraid the sound reviews were over-rated. They are not. Denon has done a top notch job with the quality. Also, the Audessy sound configuration really worked well for the surround. Also, I thought that "Pure Direct" would be "Pure Hype" but it does make a difference on listening to Jazz CDs. The HDMI up-sampling issue is a non-issue for me because the sound was more important and we don't have a compatible TV yet so I can't comment on that one. It works great with the Denon DVD Player and old-school Sony VHS that we have. I bought it at retail from Crutchfield because I was like them and it was an authorized dealer. Denon's site concerned me about un-authorized groups. If I was going on odds, I probably could have saved about 25% at a couple places that were practically giving it away. I am glad I bought it as I did. I don't want to bore everyone but I got to tell you that this receiver is outstanding in its performance up and down 2 ch audio Awsome! movies Awsome! multichannel music Awsome. I had a Yamaha RX-V2500 and this beats it in sound quality all the way around it sounded(2500) good and had a lot of bells and wistles(DSPs).The DACs in this receiver is top not in regards to its soundstage, presence, and cohesion. I use it as a pre/pro with a Rotel 1095 and believe that all denon receivers can compete with alot of dedicated pre/pros costing 3 times it's price. Inputs, video conversion, great sound quality, excellent picture. Represents a good value if you don't care about the weaknesses. Awful manual, Awful remote, Awful display, Overall bad interface. This equipment is user hostile. Every positive thing people say about this unit's sound and video quality is correct. However this is the most difficult to use receiver ever built. I'm a network engineer who loves reading operating manuals and home theater is my passion. My wife has a Masters in Mechanical Engineering. We are no strangers to troubleshooting and technical jargon and hookups. I thought it was just a learning curve and I would get over it. Nope. I still have the manual on the coffee table after two months of constant use and setup. I used it last night to lookup how to change the soundfield (for the third time). How to change an option when I'm looking right at it is a challenge. They use different terms between the remote, the manual, the on screen display and the unit LCD. The whole interface is inconsistant. It's like each section was programmed by different engineers in different countries. Forget about the casual user (wife, baby sitter, etc) getting the hang of this thing. My wife doesn't even listen to music anymore because changing the input is confusing. "That's the number 5 key." she says "Yes but it also changes the input on the amp" I say. "Just forget it" she says, "I'll sit in silence." Want more examples? The remote: To control the reciever (the most common use) you have to click some hard button on the remote to get the soft buttons to light up. Already my wife is annoyed. Then you have to click the "amp" soft button. But you better not click it twice because then you are in a different mode and then you have to click it three more times to cycle back to the regular amp control mode. And one of those modes you cycle through is 'system call' programming mode. How do you know you are in a different mode? Only by subtle differences in what buttons are enabled. Try telling your wife, "you've clicked the amp button too many times and accidently entered 'system call' mode and erased all of the programmed frequencies and macros". This is a very real possibility with this remote. I could go on and on with the speaker binding posts being way to close together (too close for even my banana plugs), to the labeling of the inputs on the back, to the way you change the soundfield to the user manual that is full of special conditions like "if this then this, except this and that, then only if the other thing." How is it possible that the $300 Sony in the spare room is easier to use? It's even got more inputs and soundfield settings. The answer is that Denon spent the entire budget on sound/video quality. If you are ok with that (or the only person in the house) then this thing is for you. As for me, I wish I stepped up and bought the B&K.